Trained Rottweilers and ladders at the park!! A really well trained Rottweiler named Blanco can climb the ladder, he enjoys playing at the park with his owner and his German Shepherd friend but his favourite part of the play is climbing ladder. 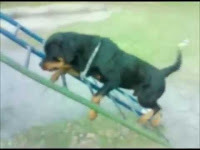 Many will judge the owner of the dog because climbing ladders may be dangerous for this powerful rottweiler but the owner said that even though many times he tried to tell the dog not to do it, he keeps doing it.